The iPhone, iPod Touch , and iPad have all made it relatively easy to quickly snap photos of life’s special moments and share them with your friends and family, especially with the recent release of iOS 5. However, a revolutionary iPhone app called “Storie” has just launched, and it has made it incredibly easy to share your photos in a warm and aesthetically pleasing way with beautiful, virtual photo albums. 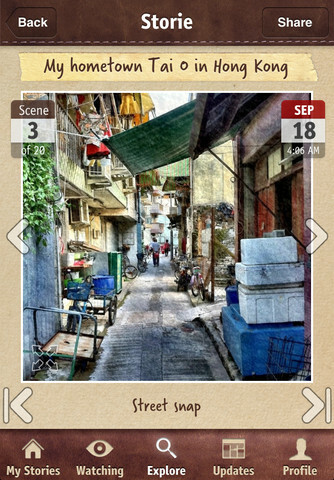 With Storie, you can create a gorgeous, virtual photo album and share it with others. Upon launching Storie, you’ll be able to quickly get started by either signing in via Facebook or creating your own account. Once you’ve set your login information up, you’ll immediately get to jump into creating your first “storie” by giving it a title and adding tags so that others using the Storie application can find it! Once you’ve done this, you’ll be able to begin snapping photos and adding them to your virtual album. If you decided to link your Facebook and Twitter accounts, you can even update them with your new pictures as you go. 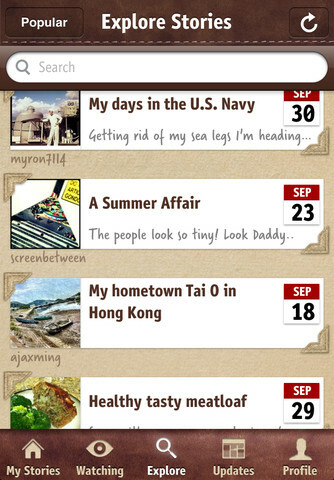 Storie makes it incredibly easy to keep your family and friends updated with each new update you make to your storie. Photo editing is also included which allows you to make changes to your photo quickly just before uploading. There’s no need to jump over to another photo editing application to make changes. All of the popular effects are included right within “Storie” so that you can quickly pump out beautiful photos for your album. Another major feature that Storie brings to users is its Search and Explore functions. Using these features, you can search for other stories by browsing or typing in the keyword you’re looking for. If you’d like to look at a storie on cooking, you could search by “food” or “cooking” to locate the best stories. Once you’ve found a storie that you really like, you can track it by adding it to your Watch list. By tracking, you’ll get immediate updates as they come so that you’ll never miss a beat as the storie unfolds. What’s great about Storie as well is that its available as an iPhone app , and it’s also compatible with both the iPod Touch and iPad . This also means you can link your account across your devices if you’ve got multiple Apple products. If there had to be an improvement made to Storie, it would more than likely be support for video. One of the greatest advantages that a virtual photo album has on a real one is that you can design support for things like this. If Storie could support video files uploaded to the album, it would more than likely be a flawless app . AppSafari review of Storie was written by Joe Seifi on October 24th, 2011 and categorized under App Store, Free, Photos, Social. Page viewed 5768 times, 2 so far today. Need help on using these apps? Please read the Help Page. Thanks for reviewing our app and for the very helpful product feedback!